SAIL GEORGIAN BAY - FUN FOR KIDS 8 to 18! There are a lot of amazing activities to do in our area and one of the gems for youth is the sailing program at Sail Georgian Bay operating out of the Meaford Harbour in July and August. It all started with the Georgian Bay Sailing Association in 1995. 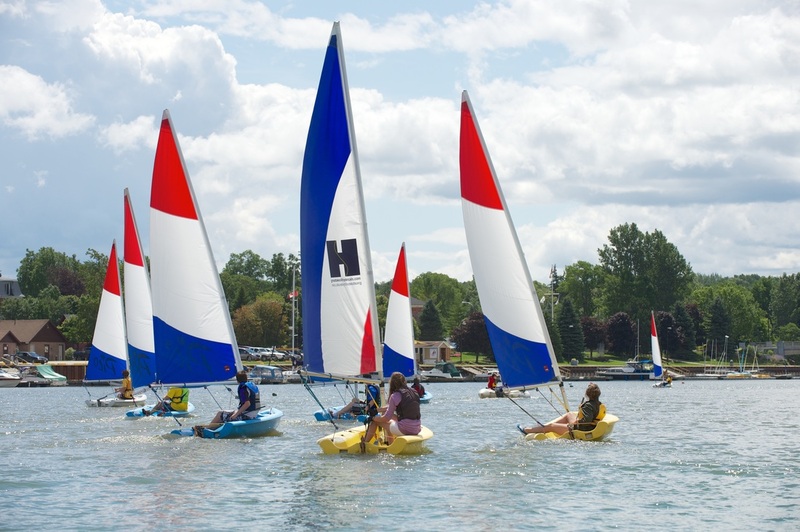 The organization brought the Ontario Sailing Association BOOM Mobile Learn to Sail program to Meaford, Thornbury, Collingwood, Owen Sound, Midland and Tobermory. It was recognized that a school was needed and would also be a great asset to the community. It would provide a new generation of young people the opportunity to learn to sail. In 2001 Sail Georgian Bay was founded with help from the Georgian Bay Sailing Association, Ontario Sailing, community members and a grant from the Ontario Trillium Foundation. Many past presidents and members of the Georgian Bay Sailing Association got the school up and running with their hard work and dedication. One of those people was Rhoda Ironside. Rhoda was tenacious and worked tirelessly to grow the school. She loved providing this opportunity for children and teens in the community and cared deeply about the sailing program. Local families, yacht clubs, businesses and service clubs have all contributed to the success of the school over the years. The school started with just 8 little Mango Escape sailboats, a coach boat and space at the Meaford Harbour. In 2007 Sail Georgian Bay became incorporated as a not for profit sailing school. Rhoda sadly passed away in 2011 however the school is still going strong and continues to grow and flourish. As with all successful organizations we have to continue to plan for the future. The school began with one small garden shed and then expanded to three garden sheds but we are bursting at the seams. We have to store all of our boats off site and our dream is to have all our equipment in one place. We are excited to announce that we have a building permit and the necessary approval to erect a larger 864 square foot building that will replace the garden sheds and will house all of our boats and equipment. We are currently fundraising for this worthy cause and much needed facility. Your contribution will make a difference and is greatly appreciated. Cheques can be made out to “Sail Georgian Bay Inc. – Rhoda’s Boathouse Project, PO Box 3253, Meaford, Ontario N4L 1A5. Each year during the months of July and August you will see the little dinghies out in the Meaford Harbour and the sounds of children having a great deal of fun. Not only are they learning to sail, they are learning the value of teamwork, fair play and hard work to achieve a goal. The school uses the CANSail Dinghy Program developed by Sail Canada and currently offers Levels 1 through 4. We also have an introduction to racing program that runs one night a week for students who want to try competing in a fun and supportive environment. CANSail programming means lots of time on the water in a safe, fun and active learning environment with CanSail certified instructors delivering a standardized curriculum. Sailors learn new sailing skills and have fun and challenging experiences suited to their age and level of skill. The programming is designed to get - and keep - sailors excited about sailing for life! The school provides summer employment for students who have obtained the necessary credentials from Sail Canada. Most of our instructors have gone through the school themselves and return as instructors who are passionate about sharing sailing with the new students. We also have a junior instructor program whereby students who are considering becoming instructors themselves can volunteer their time at the school and work directly with a certified instructor to obtain experience and also to decide if they would like to pursue their instructor status. Our instructors have to continually upgrade their skills through courses at Ontario Sailing in order to remain certified giving us a very highly qualified staff. The school also provides great opportunities for anyone interested in volunteering and we have been blessed with the best! These wonderful people, both children and adults help set up the boats and docks in June and clean, varnish and repair equipment and take inventory before taking everything to storage at the end of August. Volunteers run our annual regatta, supervise children, distribute information, write news releases, help raise money, help with registration, bookkeeping and anything else that needs doing. There is never a shortage of work to be done but it is happy work and the smiles at the end of the day make it more than worthwhile. As the school has grown so has our fleet of boats. We now have four coach boats, thirteen Laser Picos, one Minuet and four 420’s for a total fleet of over 20 boats. Visit our website for more information about the school and to register students for the 2015 summer season. Class sizes are limited so register early to avoid disappointment. If you have any questions at all email or call and we will be happy to help. We are having a “Get Out on the Water” day in partnership with the Reef Boat Club on June 20, 2015 so we invite you to come down to the beautiful Meaford Harbour and see what we have to offer. We hope to see you out on the water!